No. 4 seed Virginia Tech defeated No. 13 seed Saint Louis 66-52 on Friday night to advance to the round of 32 in the 2019 NCAA Tournament. The Hokies improved to 25-8 with the victory, while the Billikens ended their season at 23-13. The Hokies will face No. 12 seed Liberty on Sunday night, as the Flames upset No. 5 seed Mississippi State on Friday. Virginia Tech did not play particularly well in the second half, being outscored by Saint Louis 34-26, but it didn’t matter. The Hokies dominated the game in the first half, taking a 40-18 lead into the halftime intermission, and then coasted their way to the relatively easy victory. As the pregame stats foretold, Saint Louis proved to be a poor shooting team. They were just 4-of-23 (17.4%) from three-point range against the Hokies, and only 19-of-52 (36.5%) overall. 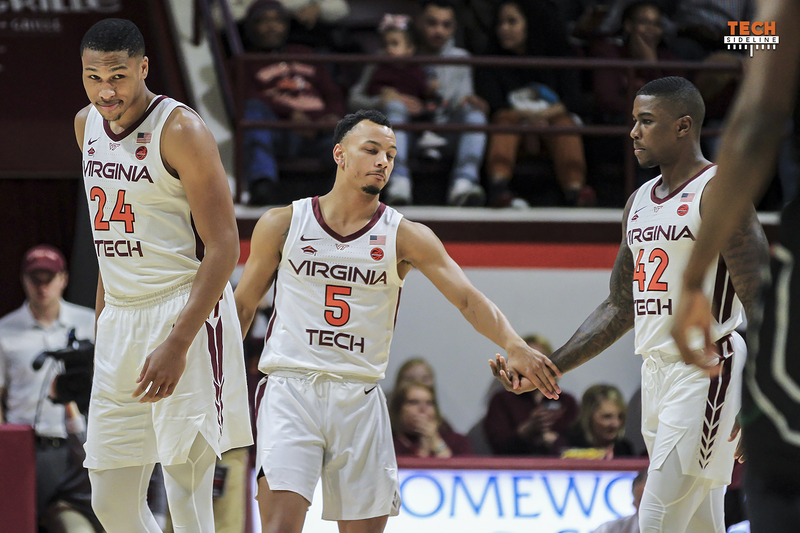 36 of their 52 points came from the paint or the free throw line, and although they played a good game overall in the second half, they couldn’t overcome an excellent first half from Virginia Tech. The Hokies made just four field goals in the entire second half, going 4-of-19 (21.05%). However, they dominated the game so much in the first 20 minutes that it didn’t matter. In the first half, Tech was 16-of-29 (55.17%) overall. The Hokies were 22-of-27 (81.5%) from the free throw line for the game, including 17-of-21 (80.95%) in the second half. That second half free throw performance overcame what turned out to be a not-so-good overall offensive performance against one of the better defensive teams they’ve faced this season. Sophomore guard Nickeil Alexander-Walker led the Hokies with 20 points, and he was second on the team with six rebounds. Alexander-Walker was 8-of-13 from the field for the game. Kerry Blackshear had 15 points, and the redshirt junior forward was an impressive 11-of-12 from the free throw line. Ahmed Hill added 10 points for the Hokies. Senior point guard Justin Robinson made his much-anticipated return on Friday night. He didn’t start the game, but he played 28 minutes, scoring nine points and dishing out two assists. Robinson played well in the first half, but was noticeably tiring towards the end of the game. He was 2-of-7 from the field, and he had four turnovers, but he also had two steals, and it was good to get him a lot of playing time before Sunday’s critical matchup with Liberty. He spent much of the game off the ball, with Alexander-Walker running the point. Though the Hokies played well offensively in the first half, it was their defense that won the game. They forced 18 Saint Louis turnovers, and outscored the Billikens 25-13 in points off turnovers. Tech had nine steals for the game, including three by Nickeil Alexander-Walker. Virginia Tech will face a hot Liberty team on Sunday night. The Flames won the Atlantic Sun Tournament Championship, and they are 29-6 on the season. They defeated No. 5 seed Mississippi State 80-76 on Friday night despite trailing by as many as 10 points with 7:18 remaining in the second half. Tipoff is scheduled for 7:10pm Eastern time on Sunday, and the game will be televised by TBS. defense so important when facing hot teams. get the stops and our points will come. Give me Liberty or give me death! Extinguish the Flames. Hope to see more baseline drives from Med next round. Things could not have been set up any better for us to get to the S16. Still disappointed that Bede is so ineffective offensively. He can’t drive by defensive mismatches. Always seems to get beat to the spot. Seems lost when he gets in traffic. And can’t finish. I wouldn’t care except for he is our PG next year, at this point. If we have another coming in I can see Bede getting replaced. Pumped for tomorrow and will enjoy this for as long as it goes. What a great feeling to be still be playing! Another great tie by Buzz last night! Go Hokies! Bede is a great defender and is very competitive. He’ll be all right. Come on….you have to be honest…..Bede continuously shows he is an offensive liability. Like NAW he often demonstrates bad ball security and turns ball over with bad passes. Bede can’t make most open look shots anywhere on the court to save his life. He cannot iso & generate his own shot when the team needs a score or just some kind of point contribution from the sum of its parts. I’ve played pickup games with players who are more of an offensive threat than he is right now. I agree he is a good competitor and has good defensive EQ/IQ but he really needs to spend his off season in an offensive shooting clinic this summer. Otherwise, I can pretty much forsee he will be replaced by next years’ Anthony Harris from PV1…he’s the truth. nice write up and insight to the game. chris, one point and question . has the state of VA ever had this many teams is NCAA tournament ; UVA, TECH, Liberty, ODU, VCU. ! seems like the most that I can remember . yes put out the Flames and go HOKIES ! Great question and also interested in this. Hope someone knows the answer. Great job by our guys! 5 was a sight for sore eyes! Great game Hokies!!! Do it again to Liberty! How Sweet it will be! The “Fightin’ Falwells” are going down!